Acupuncture For Sciatica. What Causes Sciatica? 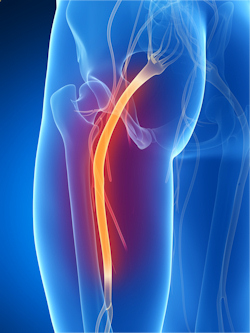 Sciatica is a pain in the back or side of the leg due to irritation of the sciatic nerve. It is felt in a line from your lower back, to the buttock, then down the thigh, to the calf, and possibly all the way down to the foot. The pain can range from a leg cramp to excruciating, shooting pain. It is usually one-sided, but in rare cases may be felt in both legs. It may also cause numbness or tingling in the extremities as well. Spondylolisthesis– a condition in which the vertebrae has slipped forward and is displaced. Causes severe pressure on the sciatic nerve. Piriformis syndrome– the piriformis muscle extends from the sacrum (above the tailbone) to the greater trochanter (top of femur). The sciatic nerve passes directly through the piriformis muscle, so if there is spasm or compression of this muscle, it will pinch the sciatic nerve. Pregnancy– as the uterus expands, it may put pressure on the lower spine. As the baby shifts in the third trimester, it can rest directly on the sciatic nerve, causing the pain. How can Acupuncture and Chinese Medicine Treat Sciatica? Since sciatica is a referral pain, it is important to first distinguish which of the possible causes above is resulting in the sciatica symptom. Once the root cause is determined, a strategy can be put into place for needle selection. If the cause is due to any of the spinal problems (herniated disc, spondylolisthesis, stenosis), then the needles will likely be placed just off of the spine in order to stimulate the surrounding muscles and tissue to help correct the misalignment, as well as stimulate the ligaments and connective tissue to bring the spine back into place. If the issue is muscular, the needles will either be inserted into the piriformis muscle to help relax and restore normal function, or the needles may be placed in the ankles and wrists to help restore normal function distally. Acupuncture is able to relax muscles, relieve pain, restore normal function, and help the body heal itself naturally. To find out why the needles are sometimes only used in distal locations to the problem, click here to learn more about the Balance Method used at the clinic.